Book BHP UK DPF Error Removal & DPF Error Deletion Right Now! Everything you need to make your vehicle more responsive and efficient. Our DPF service is the answer! 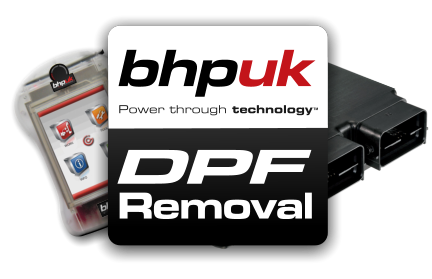 Why choose BHP UK's DPF Removal & DPF Error Deletion? Having problems with a DPF Error (Diesel Particulate Filter Error)? Expensive repair costs? Poor MPG whilst DPF is regenerating? Need DPF Removal from your vehicle? BHP UK has the answer. Our DPF technicians can modify the DPF software in your vehicle’s ECU, offering simple and easy DPF Removal from your vehicle without any error codes/warning lights being logged. This also removes the need for any future visits to the garage for DPF regeneration. A DPF is a device that has been designed & included in the diesel engine’s exhaust system to trap diesel particulate matter/soot from the exhaust gasses and remove them. The DPF removes harmful toxins and lowers diesel engine emissions making the diesel engine more environmentally friendly. The DPF works alot like the conventional petrol engine’s catalytic converter. Although the aim of the DPF is a great concept, it actually brings up a lot of new problems. And we know this because we are being contacted everyday by unhappy customers, who are facing expensive dealer repair costs, at times over £1200, when their DPF removal light comes on, indicating that they have, at minimum, a partial blockage in their DPF exhaust system.